Includes worksheets for all episodes of Advanced 1 (35 to 96), Advanced 2 (1 to 20), and Notes in Conversations (1 to 13) each with the full Spanish transcript, key vocab and grammar list, and useful exercises. BONUSES! 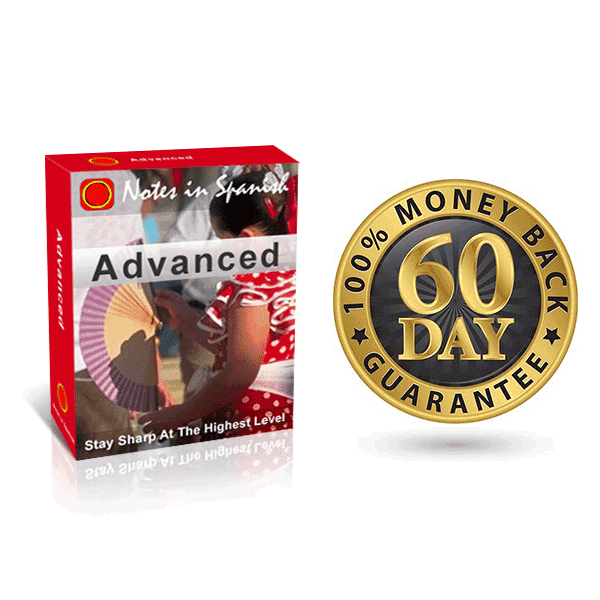 Our super “Real Spanish Archives bonus PDF”, plus Instant digital access and Full 60 Day Money-Back Guarantee! Stay fluent and completely up-to-date with real Spanish in use today. Useful exercises so you’ll remember all the new Spanish! Our ‘Real, Essential Spanish’ list of the most important and contemporary Spanish from each episode, what we know you need to know. You will reach a bilingual level of Spanish faster! The advanced worksheets have helped with my Spanish hugely. I’ve dropped other learning techniques (text books) to concentrate my time on Ben and Marina’s NIS podcasts and accompanying worksheets which are educational, accurate and interesting. I would recommed them to anyone wanting to learn Spanish and tired of text books. If you are wanting to speak Spanish to Spanish people and not simply order cerveza then these worksheets are perfect. I have improved with every lesson and the worksheets provide me with loads of extra practice. There is loads of work on them, a full transcription, and exercises which are really stretching me! There is so much in each worksheet that it can keep your interest for a good while. BRILLIANT!!!! I learn Spanish as a hobby, started a few years ago first with a Finnish tutor and later with a native from Spain. Being just a hobby with a few lessons a year, I am very pleased to be able to use the language as much as I do today! I didn’t hesitate to purchase the whole package of Advanced Worksheets. The amount of material is surprisingly large. I have noticed already how the audio and worksheets together help to improve my every-day vocab for common, up-to-date issues. The transcripts have provided me with a key to the content of the podcast which often whizzes by so quickly to the unrtained ear. It has enabled me to tune in to the way certain words and phrases are run together, and the inflection that is used, so that when I am involved in real conversation I am able to synthesise a higher volume of incoming Spanish at speed. I realized that it was nearly impossible for me to study the Spanish being spoken in the streets, as people spoke fast, and I had a hard time understanding. I couldn’t ask people to stop and repeat every other sentence. Notes in Spanish was the perfect resource. You learn the Spanish being spoken in the streets, and with the worksheets, you can follow along and know exactly what’s being said. Me gustan mucho estas lecciones. The transcriptions were essential for my understanding of the conversations. I am a visual person. First I listen, then read the transcript, then listen with transcript, then I make a few notes. I received compliments on my Spanish. Thanks! These guys are amazing. I listen to their podcasts in the car and when at home I listen and read the transcripts. It’s truly is the best way to break out of being intermediate to an average advanced. Their context is interesting too and I love the colloquial stuff because let’s face it that what we need as learners. Go for the whole enchilada because you won’t waste your money as there is nothing better out there. I’ve been told I have a good Spanish accent I think it’s because I copy Marina ? thank you for that ?? thank you Ben and Marina and your team for your great work ??? Love the transcripts and worksheets which have allowed me to jump up to another level in Spanish. Even my professor at uni has noticed the improvement. I can’t recommend highly enough Ben and Marina’s NIS – in fact I have indeed recommended it to many people I know learning Spanish as one of the best, if not THE best, resource I have come across! 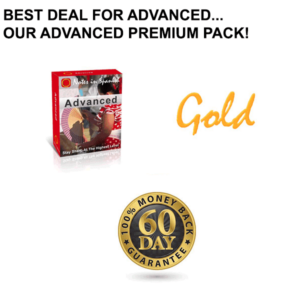 The conversations are always interesting – I have worked my way through the Gold and the Advanced packs and am now enjoying the conversations – and can honestly say there has never been a dull moment! The transcripts are such a valuable resource to accompany the conversations with a really useful quantity of new and interesting vocabulary with explanations. I love the fact that the topics are very relevant to life in Spain, and its culture and history. Highly recommended! I am a teacher of Spanish in the UK, and find these resources excellent for both keeping my own Spanish up-to-date and for recommending to my more advanced learners. Ben and Marina have a very natural approach, and all their materials are excellent. Six years ago, when I retired, I started my Notes in Spanish adventures. I bought the Intermediate level, then backed up to Beginners and I’m slowly making my way through the Advanced podcasts and worksheets. My Spanish has improved immensely through fairly consistent home practice and conversation groups. I feel like I know Ben and Marina, and I enjoy their topics. Spain has a special place in my heart, and Ben and Marina help me stay connected. As a teacher, I appreciate their ability to scaffold the learning experience through the levels. I’ve been enjoying the latest advanced podcasts through emails, but haven’t bought the worksheets since I’m still slogging through the Advanced 1 set. Now I just have to find a way for all the wonderful vocabulary, grammar and usage to stick in my memory. Gracias, Ben y Marina. I have tried many different Spanish courses over the years but none have compared with NIS when it comes to taking my Spanish up to the next level. Their audio interviews and conversations with real spanish speakers together with accompanying trancsripts and exercises get you to understand and analyse Spanish as it is actually spoken by native Spanish speakers like no other way. I listen to the podcasts while doing the housework and repeat, repeat, repeat until I pick up the jist of the conversation – it’s always on an interesting subject, so I learn something along the way, especially about Spanish culture – love Ben & Marina’s materials! I’m an enthusiastic member of NIS. It’s informative, fun and very productive! Marina and Ben offer an outstanding (and unequalled) array of exceptionally informative audios, transcripts and videos that bring the culture, lifestyle and language of modern Madrid and Spain to your doorstep. They are an engaging couple whose charming humor and extensive expertise will open your world to many new adventures. I wasn’t sure how much extra value I would derive from the worksheets, but they are well worth it. I read each one several times and study the vocab that they highlight, and it is really making a difference to my spanish. With the worksheets, I can really focus on how Marina phrases things, and I learn a lot from Ben’s mistakes too. (Don’t stop making them please Ben!). The topics they cover are interesting and topical and they have such a great rapport together. They are funny too, every podcast makes me laugh. Highly recommended!